רה”מ בנימין נתניהו שוחח הערב עם יו”ר מפלגת יש עתיד יאיר לפיד. Exit polls show Yesh Atid with surprise success, taking second place with 18 seats. Bayit Yehudi fifth largest. Exit polls from Tuesday’s elections, released at 10 p.m. as the polls closed, showed Likud Beytenu winning with 31 seats. 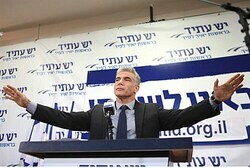 Yair Lapid’s Yesh Atid party surpassed all its achievements in previous surveys and earned 18 seats, putting it in second place. The Labor party was in third with 17, Shas was fourth with 13, and Bayit Yehudi (Jewish Home) was in fifth with 12. Another elections day victory went to the Arab-Jewish Hadash party, which earned five seats. Voter turnout numbers highest since 1999; Likud Beytenu plummets; Labor polled to get 17 seats, Bayit Yehudi 12, Shas 11, Livni and Meretz 7 each, UTJ 6; Right bloc with slight edge over Left. Binyamin Netanyahu looked likely to squeak through with a narrow victory in Tuesday’s Knesset elections, exit polls released as soon as the ballots closed seemed to indicate. Exit polls from Channel 2, Channel 10 and Channel 1 gave his Likud Beytenu party 31 seats. It seemed that the right-wing bloc had a slight edge of 61 seats to 59 seats over the left-wing bloc. “I thank you for giving me the opportunity for a third time to lead the State of Israel,” says Netanyahu in victory speech. 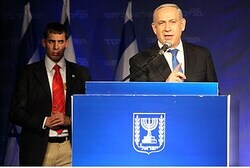 Prime Minister Binyamin Netanyahu, who will head a large but weaker Likud party in the new Knesset, gave a victory speech at his party’s headquarters on Tuesday night. “You have once again proved that Israel is a vibrant, dynamic, exemplary democracy, and I am proud to be your Prime Minister, and I thank you for giving me the opportunity for a third time to lead the State of Israel,” Netanyahu told the Israeli public. “This is a great honor but also a great responsibility. Channels 1, 2 and 10 publish exit polls, presenting tight race between left and right. Israel’s three major television networks published exit polls on Tuesday night, after polls closed across the country at 10 P.M. According to Channel 2’s exit polls, the battle was tight between the left and right, with 59 percent of votes going to the left-wing block, and 61 percent to the right. Channel 2’s exit polls showed Likud-Yisrael Beiteinu exited with 31 seats, followed by Yesh Atid with 19 seats, and Labor with 17 seats. Habayit Hayehudi and Shas both got 12 seats, followed by Meretz and Hatnuah, who both got 7 seats. United Torah Judaism was next, with 6 seats, followed by the Arab parties, Hadash, with 4 seats, United Arab List – Ta’al with 3 and Balad, with 2. Kadima did not pass the threshold, nor did Otzma Leyisrael. According to the exit polls of Channel 10, the party with the most seats was Likud-Yisrael Beiteinu, 31. Following in second place was Yesh Atid with 18 seats, and Labor, with 17 seats, followed closely in third place. The rest of the parties that passed the threshold were: Shas, 13, Habayit Hayehudi, 12, Hatnuah, 6, Meretz, 6, Yahadut Hatorah, 6, Hadash, 5, United Arab List – Ta’al, 4, Balad, 2. According to Channel 1, Likud Beiteinu won 31 seats, followed by Yesh Atid with 19 seats and Labor with 17 seats. Habayit Hayehudi got 12 seats, Shas 22, Hatnuah 7, Meretz 7 and United Torah Judaism 6. The Arab parties followed, with Hadash garnering 3 seats, United Arab List – Ta’al, 3, Balad, 2. According to Channel 1, Otzma Leyisrael also won 2 seats.